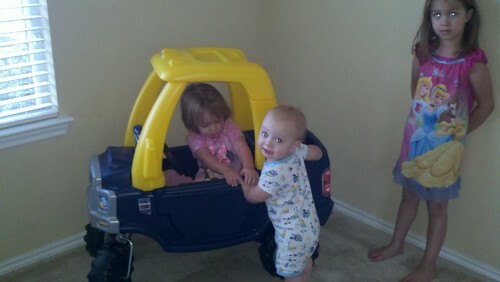 One of Achoo's birthday gifts was a Cozy Coupe Truck that we got off Amazon because it was cheaper than Toys R Us! I was so excited when it arrived but we let it sit in the box for nearly two weeks...and finally, Achoo turned 1! Come to find out, Peanut loves his car too! And, while we were going to let him use it inside for a bit our walls, cabinets and electrical outlets got dinged quickly so its an outside toy. Thankfully here in Texas its almost always outside weather...just depends on the time of the day! We only do outside time now in the morning and late at night! But, that's another story for another day.